Occasionally a church leader will tell me “Amy, our church is small. We don’t have the resources and capabilities needed to set up a special needs ministry.” I get it. Not every church can offer a full service ministry that involves multiple special needs classrooms, parent support groups, and respite events. However, every church can successfully include children with special needs. Liberty Hill General Baptist Church in Dexter, Missouri is the perfect example of such a church. On any given Sunday the total attendance of this rural congregation is around 300 (this includes all attending adults and children). The Church sits between a bean field and a wheat field. The church does not have a named special needs ministry. They don’t offer parent support groups. And they aren’t set up to host regular respite events. But if you were to walk the halls of the children’s ministry this coming Sunday morning, you could expect to find nine children with a range of special needs, all being successfully included in their respective classes. Many of you have seen the popular post on this blog describing the Transitions Box that the children’s pastor at Liberty Hill set up for one child with autism. Over the past couple of years this church has one by one added ministry participants with special needs as well as new strategies to successfully include those children. This past week Cheryl Parrish, the Children’s Ministry Director for Liberty Hill, caught up with me to talk about some new tools the church is using to better include kids with special needs. With the new Sunday school year one of the changes being implemented is having visual schedules posted in every classroom. Volunteers are currently receiving training on using the schedules and their importance. Shown at the top of this post is the movable visual schedule that Parrish created for small groups that travel from one environment to another. These schedules are also used with children who rotate through stations inside their classroom. The schedules shown above are affixed to the back of a 12” ruler. You may notice the schedule marker with a “?” in the above picture. Because many groups change stations, centers, and featured activities each week, the question mark symbol can work for many things. 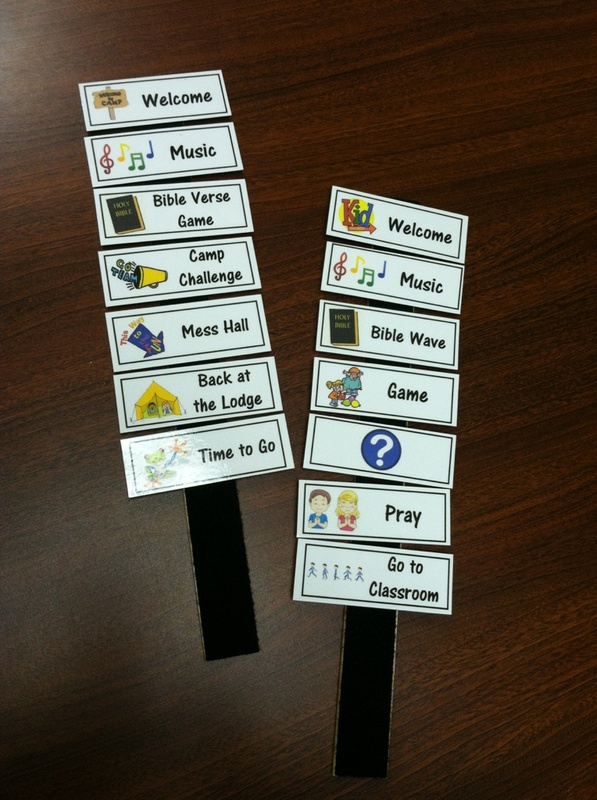 Belinda Worley, MS-SLP-CCC, a speech pathologist working with the children’s ministry, suggested using the symbol for a schedule place holder. Worley explained that the children just needed to know that “something” was coming next…before snack, before music, before going home etc. Knowing the exact details of the upcoming activity is often less important than knowing the order of the events. Parrish shares that the movable schedules will be especially helpful for the church’s VBS, where children rotate from station to station. We’d love to see your special needs inclusion tips. What strategies are you implementing this year to better include kids with learning differences? Thank you Amy for spreading the word how simple things can help a special child. Cheryl has bent over backwards to help our special needs children at Liberty Hill. The transition box that you referred to was made for my son Kyle. Since Cheryl has created this box, Kyle has only had to come to me one time. The one time that he had a complete melt down was recently when his brother who is now in the 6th grade was moved up out of their classroom. This was a big move for Kyle, but the next week he did fine. Thank you, again, for spreading the word about the little things that help the parents with special need children.